We’ve all been there. The day our partner or ‘significant other’ tells us they love camping and are whisking us away to the middle of nowhere to live under a piece of tarpaulin for a week. That’s not a good day. Especially for us girls, who rely on electricity to keep us looking like, well, girls. a) You won’t have anywhere to plug them in. b) You’re hair will be so damp and you’ll be so cold, after a few days any urge to even try to improve your appearance goes away. My second piece of advice would be to go to Primark (UK) or any cheap clothing store and buy the cheapest, warmest clothes you can find, because when your out there it’s going to be freezing cold and muddy, so any expensive clothes you get will just end up in the bin when you get home. Camping is on Fire! No really, our tent is on fire. My final bit of advice would be to make sure any fires you light are a good distance away from any flammable material. Like your tent. Ours was made from VERY flammable material apparently; a lesson learned when we attempted to roast marshmallows, which are also pretty flammable. So, leading off from that, I suppose another tip would be to have some way of putting out fires nearby. At the end of the trip, I was cold, I was wet, and I was muddy. I swore I would never go again. We are planning another camping trip next month. If you are looking for some more expert advice on girls/women going camping; be sure to read the article Camping for Girls:Peeing Outside it will do wonders with helping you if nature does, in fact, call. 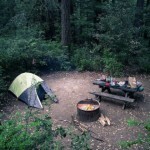 No responses to "A Girl’s Guide to Surviving Your First Camping Trip"